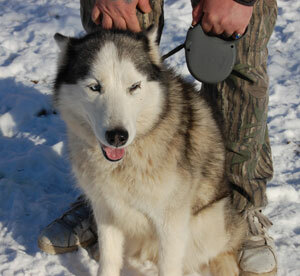 Brenna is a beautiful 8.5-year-old female husky who is in the prime of her life. She is at the perfect age – calm and trustworthy in the house and loves to play and have fun. Brenna is great with kids and other dogs, but not cats. She loves to romp with the kids and play with the other dogs and then is very happy to come back inside for quality people time with lots of cuddles and kisses. She is a very social Siberian and everyone she meets is her new best friend. Brenna may not have always been as happy as she is now. Her family asked someone to watch her and then abandoned her. We cannot believe someone would be able to give up this wonderful, sweet girl. If you are looking for a faithful companion that is certain to add fun to your life, Brenna may be the perfect one!